If you’re in the mood to treat yourself to a lovely little something, look no further than Sjal’s Wanderlust Travel Set. The New York based company is quickly becoming a firm favourite of mine – their products are universally impressive, with beautiful scents and incredible results, each product I try out just gets better. If you don’t trust my recommendation, Sienna Miller, Uma Thurman and Katie Holmes are all noted fans. 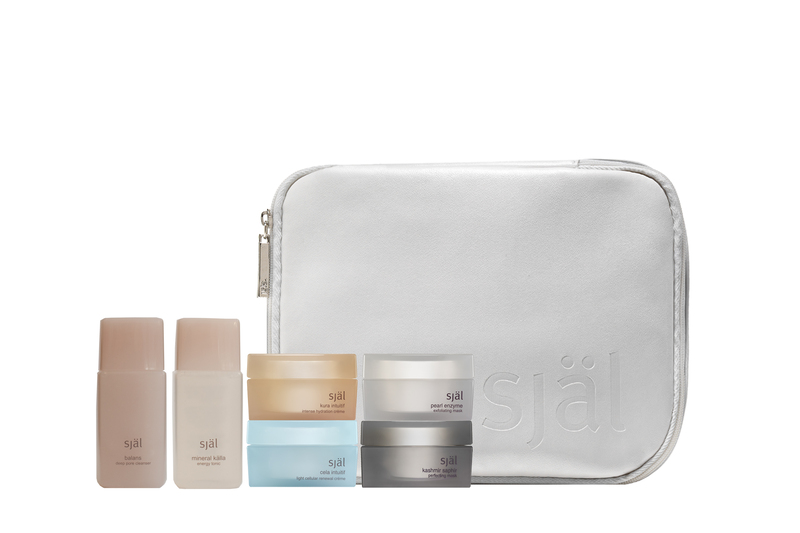 The travel set is a complete godsend to anyone getting ready for their vacations, or if you want to try out a wide range of Sjal products this is the kit for you. Within a chic little pouch, you find 6 products which come together to make up a complete skincare regime which feels beyond luxurious. To make it as clear as possible, I will list the products included along with their reviews below. Balans Deep Pore Cleanser – This is a no-foaming cleanser which cleans the skin gently but effectively. The gel is super thick without feeling gloopy, and my face always feels wonderfully clean after using it, but without any of the dreaded tightness which I get with some other products. Since I’ve been using the cleanser, my skin has been super clear and really healthy looking, and I’m crediting the gold, silver extracts for the glow! Mineral Källa Energy Tonic – To be honest, this was the product I was most worried about trialling. My skin can get super sensitive, and tonics and toners can be super harsh and drying for me. Not so with the Mineral källa – the tonic is again infused with gold and silver which work for their anti bacterial properties, whilst rose quartz and rhodonite elixir gently calms my skin. Unlike other tonics I have used, this just disappears into my skin when applied leaving me with skin which feels perfectly moisturized and refreshed. Pearl Enzyme Exfoliating Mask Polish – This is the only part of the kit I haven’t tried, but it sounds sublime. The mask has two forms of exfoliation – enzymatic and the more regular topical exfoliates. Fruit derived enzymes remove dead skin, whilst crushed pearls exfoliate the surface of the skin as well as being used for their brightening effect. If crushed pearls in your products aren’t decadent enough, diamond, sapphire, ruby, citrine and amethyst extracts are also found in the mix! Kashmir Saphir Perfecting Mask – this product is such a godsend for anyone like me, who enjoys a good face mask despite having sensitive skin. Before my little sojourn in London, I was in major maintenance mode – and this little pot ensured I was break-out free for my trip. The mask itself is a light gel in consistency, and is a beautiful turquoise-blue colour thanks to the Blue sapphire which is included for its skin-clearing properties. When applied, it feels wonderfully refreshing and the colour disappears instantly; there was a slight tingling sensation when it touched any pimple, although it was nothing major, just proof that it was working. I left it on for about 20 mins, enough to let it dry fully, then washed it off with a warm face cloth, then patted on a little moisturizer and went to bed. When I woke up the next morning, the little bumps which I had the previous night were completely gone. This is such a little miracle worker for times when you need a quick fix before any sort of major event – just apply all over your face, let it dry, then wash off, and the next day you wake up with skin which is perfectly smooth and all glowy – perfect! Cela Intuitif is a brightening moisturizer, which is just perfect for day use. The cream is wonderfully light, and it sinks into clean skin easily, smelling completely divine (think a light orange blossom), and provides a great base for makeup application. Kura Intuitif is the richer of the kit’s two moisturizers, and I tend to use this topically as a night cream. Targeted at dry, damaged, dehydrated or mature skin, this is a godsend for post-flight recovery. If you suffer from redness, broken capillaries or rosacea I would really recommend the cream – the formulation of the product has special complexes which reduce any sort of hyper-pigmentation or rosacea as well as accomplishing the more regular tasks of fighting wrinkles and improving skin tone. In addition to all of these incredible products, you also choose between a sample of Orbe Eye Contour creme or Serum1 Liquid Vitamin Lift to add to the kit depending on your skin’s needs. The kit really is precisely what you want when you’re preparing to jet off somewhere sunny, or if you’re in the mood to revamp your skincare, I can’t recommend Sjal enough!